However, the question is inaccurate and I will try to explain this through an analogy. Let’s say I go for a walk with a friend and my friend feels a few drops of water that fall on her. She asks me if it’s raining. But as long as there was only few drops of water, it could also be something else. I tell her that we can get some more relevant information in order to get a more reliable answer. Look at the sky. Are there dark clouds on the sky above? And what does the weather forecast say? If there are dark clouds above and the weather forecast suggests showers, it’s a safe bet to say it is the start of the rain. The rain always start with a few drops, just the way a climate change starts with a few events. In the same way as with the observation of the first drops of of water, you could not be sure whether the heatwave is a freak event or the emerging pattern of climate change, if you don’t include other relevant information. There is a range of different pieces of information which are relevant when it comes to the question about weather events and climate change: (a) statistical evidence, (b) physical processes connecting different aspects, and (c) attribution work. Heatwaves are becoming more widespread, last longer, and are getting more extreme (e.g. Keellings and Waylen, 2014). This trend has been predicted and reported in multiple reports, such as the IPCC SREX (2013), the Proceedings of National Academy of Sciences (e.g. Palmer, 2009), and European Academy Science Advisory Council (EASAC, 2013). Climate change is equivalent to changing weather statistics, and one line of evidence includes the nature of record-breaking events. We can find evidence in both the number[a] and the magnitude of new record-breaking values. Coumou et al., (2013) observed an increase in the global number of monthly heat records that corresponded to what one should expect if the temperatures increased everywhere by the same rate as the global mean. They also found that local monthly records are on average five times as frequent as they would be in a stationary climate. In other words, four out of five new heat records would not have occurred without global warming. Other types of evidence includes how often the events (e.g hurricanes) take place, their duration and intensity. Standard statistical tests can also indicate whether a particular event fits in with the expected range of outcomes. Physical conditions and processes play a role both for the emerging pattern of precipitation, the evolution of weather, and their statistical characteristics. Indeed, we expect the statistics of rainfall and temperature to respond to an altered physical situation. Earth’s climate has always changed, and there have always been physical causes for the changes. This means that the climate is sensitive to altered conditions, such as greenhouse gases. It would be difficult to explain why increased concentrations of greenhouse gases had no effect on the global mean temperature or on the statistics of extreme weather conditions while other types of forcing clearly have an effect. Greater temperatures are expected to make heatwaves more widespread in general. Weaker winds circulating the pole make weather episodes such as blocking high pressure more persistent. This weakening is associated with a polar amplification and the retreat of the Arctic sea ice (Francis and Vavrus, 2012;Coumou et al., 2015). Changes in the north-south temperature differences, for instance due to the polar amplification, can increase the prevalence of the phenomenon known as “quasi-resonant planetary waves”, which is associated with heatwaves (Petoukhov et al., 2013). Mann et al. (2017) identified a specific fingerprint in the zonal mean surface temperature profile that is associated with conditions that increase the likelihood for these waves. Both the models and observations suggest that these conditions only recently have emerged from the background noise of natural variability. I have also reviewed the greenhouse effect and described how convection can be altered by higher concentration of greenhouse gases. This link with the hydrological cycle may explain why the rains seem to be concentrated over small area of Earth’s surface (Benestad, 2018). Diminished area of precipitation explains both more frequent flooding and more droughts, and dry conditions exacerbate the heat, as moisture restrain temperatures during evaporation. We also expect more extreme rainfall in some locations, as higher surface temperatures boost the evaporation and increase the turn-around rate of the hydrological cycle. There are also indications of higher cloud tops (Witze, 2016) which allow the rain drops to grow further than before. It is possible to reproduce extreme weather episodes in computer models, such as those used for weather forecasting. We can conduct experiments to see which effects greenhouse gases have for the outcome. In other words, the models can be used to simulate the same event with and without the present levels (Schiermeier ,2018). The World Weather Attribution (WWA) has carried out such experiments, and their efforts suggest that recent extreme events have become more likely with an increased greenhouse effect. The planetary system is extremely complex, with interactions between atmosphere, oceans, ice and land, and taking place over a vast range of temporal and spatial scales. It is hard to say that one aspect is directly connected to another, when there are so many interacting parts and such rich level of complexity. Understanding the difference between individual versus collective events is key to making sense of the situation. Nevertheless, complex systems tend to give rise to emergent behaviour (explained in Gavin’s TED-talk). And the statistical characteristics of a large number of outcomes is often predictable. In fact, statistics is remarkably predictable, and we can often attribute some probability to the causes of some event through standard statistical tests. On another level, there is also the more philosophical question of whether rain drops are caused by the rain or the rain is a result of many rain drops. Rain is a phenomenon that includes many collective events in the clouds. The same way that extra information such as cloud observation and weather forecast give confidence in our interpretation of the first drops being the start of the rain, the statistical evidence and our understanding of the atmospheric physics provide relevant information for judging the connection between heatwaves and climate change. I think it makes sense to rephrase the usual question of whether climate change causes a particular event, since climate and weather are different aspects of the same earth system. The bottom line is whether we now are observing the first glimpse of a new normal, or if the world will return to its old state. In other words, the question should be whether the recent heatwave is a signs of a new type of weather patterns we can expect for the future. I think the answer to this question is “yes”, based on current information and knowledge. [a] If data is independent and identically distributed (iid), then the probability of a new record-breaking event diminishes with the number of measurements ( ) . In this case, the expected number of records is . On the other hand, if you count many more records than , then that is a sign that upper tail of the statistical distribution is stretching towards higher levels. In other words, it indicates that extremes are becoming more frequent. Both the World Meteorological Organisation (WMO) and Copernicus have posted some comments and analysis of the recent heatwaves. This article, I think, makes a very important point. While following the discussion about the draught and fires in Sweden this summer, I many times wished that the media had understood the point made in this article regarding the importance of relevant information beyond the statistics of past weather. Media relies on meteorologist who in turn relies on their historical data. I think a major problem is that no universal definition of heat waves exists. WMO defines a heat wave “when the daily maximum temperature for more than five consecutive days exceeds the average maximum temperature by 9 degrees.” Hansen used a three sigma deviation above the average. The National Weather Service uses a combined heat/humidity index, and defines a heat wave as a 48-hour period during which neither the daytime high nor nighttime low falls below the heat stress threshold. Depending on which definition one uses, different results are obtained concerning heat wave trends. Since climate change will have a greater effect on nighttime lows, the latter definition will show the largest increase in heat waves. Conversely, since climate change has little effect on summer daytime high temperatures, the WMO definition is likely to show little (if any) change in heat waves over time. Most municipalities in the U.S. have not exceeded high maximum temperatures set 60, 80, or 100 years ago, but have regularly exceeded high minimum temperatures. Additionally, land changes can have a big effect. Hence, big cities are more prone to heat waves, than the countryside, which are more prone than forested areas. Land changes is another variable in their complex planetary system. I wonder whether we should continue to use the term “new normal.” I understand how it is used above, but normal lmplies something, in this case, temperature, that varies around the mean, something static. But the whole point of man made global warming is that the temperature will not simply move to some new “normal” level but will continue to increase as long as we continue to pour CO2 into the atmosphere. Isn’t the point that what is considered normal will be constantly receding, always beyond our grasp? There will never again be a normal for hundreds and perhaps thousands of years. I’m not so sure about that. The question should be whether the recent heatwaves are a reliable indicator of a new type of weather patterns we can expect now today and statistically far worse in future Climates as a direct result of Global Warming. Forecasting weather is Dan’s job, but all of Earth Science is his passion. The right question is how much of a role did climate change play in these events and over the coming months, we will have some answers. The easiest correct answer is that climate change plays a role in EVERY weather event now. It must, because the planet is around .8C warmer than 150 years ago. Want To Dig Deeper? Let’s talk about how the warming planet is changing the wind flow pattern several kilometers above the surface. This is crucial because the wind flow up high controls the weather at the ground below. If that pattern gets stuck, then the weather below it will become stagnant. If it’s a heat wave, it will continue and likely get hotter. If it’s a drought or a wet and rainy weather pattern, the same applies. If climate change is causing a traffic jam in the wind flow pattern aloft, then climate change is holding the smoking gun at the site of extreme weather events. An important paper that looks into the physics behind this was published in Nature’s Scientific Reports last May by Michael E. Mann, Stefan Rahmstorf and others. This paper may be a difficult read for non-geeks (I read it three times myself, and then asked Dr Mann to make sure I wasn’t getting something wrong!). Here is what you should worry about: Is this summer’s widespread extreme weather a climate surprise? Is this what happens when we warm the planet by .8ºC?? If so, what happens when we reach 1.5º C in 30-40 years or two degrees after that?? Here is the bad news: That 1.5 C is happening no matter what. It’s already baked into the system. It’s unlikely we can even hold below 2ºC. We could have if we’d acted 30 years ago, but too many people listened to politicians telling them what they wanted to hear. Those that stood up and told the truth, were thrown out. Just ask former Congressman Bob Inglis how that works. We are pulling the tail of a sleeping climate lion, and this summer may just be his half-awake “leave me alone” twitch. What happens in 30 years when we kick him in the side? I won’t be around, but your grandchildren will. Dan, I think that your statement that “climate change has little effect on summer daytime high temperatures” represents a serious over-egging of your beer (as people used to say, for reasons that escape me). However, note that the thing causing this low warming trend by that metric is the huge climate anomaly of the ‘dust bowl’ years. And note that, as Tamino says, “the nonlinear trend looks like it might be rising noticeably lately, maybe even getting close to as hot as the summer of the dust bowl era.” That suggests that we’re now at the point where warming climate will increasingly ‘have an effect’ on summer maxima, as reflected in the trend over the complete record. Sure enough, the US ‘dustbowl warmhole’ is clearly visible. Of course, that’s mean, not high temperatures, which is what you specified. So to look at that, I plotted NOAA US summer max & min temperatures from 1930 (NB–these are in Fahrenheit!). Red is max (scaled down by 20 degrees F for visual comparison), blue is min, and the greenish trace is the differential (scaled up by 36 F). You can certainly see the narrowing diurnal range in this data in the descending contour of the differentials, and you can see that indeed, low temps are rising faster than highs. Yet it looks to me that most of that pattern is due to the early part of the record; I don’t see much change in the differentials since 1990, if any, and it is certainly clear that highs have had a rising trend since then. All of which would incline me to believe, once again, that it’s not ‘climate change’ that is failing to affect high temperatures in the US now; it’s that back in the dustbowl days there was a huge anomaly that disproportionately affected highs. For Dan H.: The whole point of the scientific literature is to make the definition of the phenomenon that the scientist is observing, make the observations, catalog the data, publish, and let other experts evaluate and critique. The rest of your response is basic BS. If the WMO definition of heat waves shows much smaller changes, please point to a study that both claims this and claims that this is important. It is insufficient to argue “it might occur”. Yup. All those new parking lots in north of 60 Sweden and Death Valley have really changed things!!! > climate and weather are different aspects of the same earth system. I’d advice against framing it this way. It is the identical phenomena averaged over different time spans. Otherwise people might accept a different climate assuming weather stays the same. Dan H @2, it doesn’t matter too critically if different countries and agencies use different definitions of a heatwave, because its the ‘trend’ that counts. The heatwaves in America may be becoming more intense at night, rather than during the day, but that’s no consolation if you can’t afford air conditioning. Hot nights causes serious health problems. And heatwaves have already increased in frequency and duration globally according to the IPCC. They are increasing in frequency in many parts of America as well. This is just as concerning as their intensity. The recent rise in average temperature is measured across the globe. There is no surprise that from time to time, co-incidentally, heatwaves will be present in several places at the same time. Standard deviations can give an opinion on the likelihood of this happening. What will identify attribution to climate change is linkage(s) between simultaneous events attributable to changes in global systems of heat distribution across the Earth. If such causal changes are identified then we will know for sure that the situation is very serious and the time for procrastination is long-gone. It looks as though we have not reached this point…………. There is only a transition stage, until we reach the new equilibrium, or manage to avoid it. According to the NCDC USA record temperatures page https://www.ncdc.noaa.gov/cdo-web/datatools/records, in the last year there were 62 all time high records and 133 high minimum temperatures. These are always set during the summer. A 1:2 ratio. Hardly “Most municipalities in the U.S. have not exceeded high maximum temperatures set 60, 80, or 100 years ago, but have regularly exceeded high minimum temperatures”. Please provide data to support your wild claim. For the last 30 days there were 94 high maximum temperatures and 121 high minimum temperatures. More high minimum temperatures but hardly what you described. Please cite data to support your wild claims. By comparison there were 12 all time low temperatures and 9 low max temperatures in the past year. There were 7 low min and 6 low max monthly temperatures in the last 30 days. About 8-10 times as many high records due to climate change. Forgot to mention this article explanation was really good. The more times this issue is explained the better. I don’t believe there is only one best way to say it either because different people will connect with different styles and approaches. One of the things causing problems in understanding shows up by the usual question of are-the-heatwaves-caused-by-climate-change. Because climate change, as I see it at least, is a result (a measuring stick?) and not an action. Only “actions” (or in climate speak – drivers/forcings) can cause other things to happen. So while ghg etc are forcings which cause avg overall temp to rise, temperature too is a driver of the weather conditions. I think that the “problem” is that people– even scientists– can be somewhat lax in how precisely they communicate; certainly when it gets to the public through intermediaries. That’s because you want to make a rhetorical point rather than clarify the science. It is seriously confusing, I think, to say that a changed climate is caused by climate change. the frame of these questions stacks the deck. Did AGW cause this fire or heatwave? is like asking which pack of cigarettes caused a lung cancer. The baseline of increased heat creates a lot of bad outcomes in a manner that is similar to smoking a pack a day creates bad outcomes. Just keep a pack of cigarettes in your pocket. When someone comes up with the question/defense that we can’t know that AGW “caused” a heat wave or forest fire, etc, just pull out the pack and hand it to the denier and assure them that there is almost no way that this pack of cigarettes will cause them any health issues. I think there are a number of ways in which the tobacco and fossil fuel industries have muddied the waters about the dangers of their products. Specific causation is one and it is a persuasive argument to a lot of human beings. Smoke’m if you got’m. I think it should be called “the new abnormal” , or as someone pointed out recently (I think M. Mann), the new normal is much worse than the previous normal. Mike @16, well said. We have this climate change denialist in our media who keeps asking did climate change cause this specific heatwave or storm? The answer is no, so he brushes off the whole climate issue as a non problem. No matter how many times I have explained climate change causes more frequent heatwaves, and makes certain events more likely to occur, and makes them more intense he doesn’t get it, and he ignores what people say, and just repeats himself, and I think it’s because he doesn’t want to get it. He is not unintelligent, so its deliberate stupidity (in the main). I think it’s driven by his intense political tribalism. He sees environmentalism and things like carbon taxes as some form of closet socialism designed to get rid of his “freedoms” and so he minimises every environmental problem. This inane stupidity is what humanity is up against. It’s starting to make me very pessimistic that we can fix the climate problem. Repeating the point about communication (wrt attribution, in particular, and the OP headline). The problem with the response to Dan H is that you are giving an answer without first establishing the question. Do all the statistics right, avoid deception as Tamino illustrates, and what you have shown is that the climate is changing. This is not the same as “attributing” some event(s) (effect) to some cause. Perhaps it’s just laziness about language, perhaps it is reflexively getting sucked in by the other side, but it is hardly helpful in getting the issues across. The statistical relationship between heat waves and global warming needs to be buttressed with probability theory. It’s not a simple exercise, but someone needs to undertake it. Maybe I’ll ask around at the Berkeley Statistics Department (I took some courses on the subject while attending). Then, climate skeptics- who are typically not well versed in mathematics- can be put in the position of trying to dispute the evidence by claiming that the recent heatwaves are highly improbable random fluctuations. That’s a laughable position, but if they avoid it, we should point out that the denier cadre has no answer for what the data clearly indicates. Much of the research on the relation between smoking and cancer was conducted on the basis of double-blind, randomized clinical trials. And you know what? There is a REASON why key medical findings are based on double-blind trials. Because experience has shown that without conducting trials on such a basis there is a tendency for researchers to come up with the results they are looking for. It is called “bias”, OK? Much of the research conducted by the tobacco companies was faulty for this very reason. Unfortunately there is no way to conducted climate research double blind, which leaves the field wide open to findings rooted in bias. And considering the large numbers of climate scientists sounding alarms in public, the dangers of bias should be evident. Since there is currently no way to evaluate the extreme weather events we’ve been seeing lately in terms of climate change, one way or the other, those who insist on trumpeting these events as proof positive that “climate change” is now upon us and getting worse are revealing their bias. Such individuals must be regarded as advocates, not scientists. It might be worthwhile to consider this question in two stages: first, the long-standing predictions of the results of increased infra-red absorbing gases in the atmosphere (which are increasing primarily due to fossil fuel combustion), and second, the resulting changes in atmospheric and oceanic circulation that drive many of the extreme weather events. So that’s all been demonstrated; how does this affect heat waves? Well, a heat wave is associated with a lack of global circulation, a blocking high pressure system, and that’s a function of the atmospheric circulation, as well as of the average temperature increase; so yes it seems pretty clear global warming is enhancing the duration and intensity of heat waves relative to the pre-industrial normal. It’s rather difficult to come up with a robust estimate of what heat waves would look like today if humans had managed to eliminate fossil fuel use over the period from, say, 1970 – 2000, and if the global CO2 level had stabilized at say, 350 ppm, by 2000. I mean, how can one pin this down to a number like “50% of the intensity and 40% of the duration of modern heat waves are due to global warming, relative to the pre-industrial situation”? That sounds like a good scientific goal, but perhaps bigger supercomputers are needed? As far as policy, it seems like there’s no justification for not reducing fossil fuel use as fast as possible, all the scientific evidence says the longer you wait to do that, the worse the outcome will be. A decade ago people were saying that desalination would place a strain on the grid. Maybe so but the more immediate need seems to be air conditioning. That’s not only daytime AC that could be powered by solar but until say 11 pm when the temperature could still be 30C, too hot for sleeping. In still air heatwaves wind power could be at less than 5% capacity so it is not helping much with AC. Those heatwaves with wind seem to be accompanied by fires. If air con is now essential as a matter of public health and safety the economic effects are major. The grid needs to be beefed up for both line reliability and peakers run more often, hopefully not by building new coal fired power stations. This problem may be more acute in countries outside the US where natgas peaking is expensive. 1. Is climate change increasing the likelihood of the synoptic weather patterns that bring heatwave conditions? 2. Given a particular synoptic weather pattern, is a changing climate making the heatwave worse that it would otherwise be in a steady state climate. Regrading 1., the primary cause of heatwaves is stagnant anticyclones positioned in such a place as to advect warm air masses to elevate temperature on top of the localised heating effect of persistent clear skies and reduction in soil moisture. In the UK, the optimal setup for very high temperatures is a blocking anticylone positioned just south and east of Kent, which advects very warm air from as far south as the Mediterranean. The local heating on top of this can bring temperatures well into the mid 30’s C if is persists. Arctic amplification may be causing blocked weather patterns in the northern hemisphere to become more common, and my perception is that here in the UK, stagnant weather regimes have become more common in the last 10 years. A block over Greenland in summer results in soaking wet summers in the UK (e.g. 2007, 2012). If blocking high pressure systems are becoming more common, this will affect the shape of the temperature distribution, by increasing the frequency of weather patterns which generate extreme temperatures. Regarding 2., It seems reasonable to me that in a warming climate, a particular synoptic setup favourable for high temperatures will bring more extreme temperatures as the climate continues to warm. It is like shifting the temperature distribution towards warmer temperatures, even if the standard deviation remains constant. Thus it seems to me that changing the mean and the variance of the distribution will change the frequency and intensity of heatwaves. These two elements may be lost on some people, who may be inclined to think a heatwave was caused by persistent high pressure combined with warm advection, so it is weather noise, not climate. Maybe these two different ways of altering the temperature climatology should be explained clearly when interacting with the general public, rather than simply say “this heatwave is consistent with climate change”, say why it is consistent by illustrating how the two changes in the climatology distribution both increase the likelihood of extreme temperatures. I must have hit a nerve with my last post, and there are numerous responses that are both defensive and accusative in nature. We had a rather lengthy discussion regarding this on the previous epidemiological research thread, for those who wish to peruse that. I will answer some of the naysayers. Note Table 6.2 and Figure 6.3, where by coldest day of the year has increased in every region, by an average of 3.3F, with the largest increase occurring from 1980-2000. Contrarily, the hottest day of the year has decreased in six out of seven regions, by an average of -0.8F, being relatively flat over the same 1980-2000 time frame. Michael @13 who states that 62 all-time record highs were established over the past year. Considering that there are over 100k reporting stations, this represents less than one tenth of one percent of the total reporting stations and is much less than what one would expect in a normal Gaussian distribution every year. In comparison to past heat waves, 197 new all-time high temperatures were set in 2012, 75 in 1995, 350 in 1988, 132 in 1980, 194 in 1954, 793 in 1936, and 491 in 1934. Yes, both record highs and record low are decreasing, just that the record lows have decreased by a much larger amount. Kevin @5, much of what you presented are averages. Even so, the average summertime high temperature was highest in the 1930s, then the 2010s, followed by the 2000s and 1950s. A linear trend line is flat over all the data, but a quadratic shows a minimum in the 1970s. Zebra @15, this is science, not rhetoric. Several studies have indicated that the maximum daily temperature is the primary climatic factor in heat-related illness and death (socio-economic factors can be much higher). Other studies have shown the importance of nighttime temperatures. Studies focusing on the duration of heat waves have come to mixed conclusions. Whether future heat waves result in greater or less health concerns rests on whether the change in daytime maximum temperature or nighttime minimum temperature has the greater influence on health-related issues and deaths. Current indications are that future decreases in summer high temperatures may result in fewer illnesses and deaths, although socio-economic factors may still dominate. None of this negates the basic physics of global warming in which greenhouse gases have a much larger effect on the radiative transfer of energy during the cooler, nighttime periods, than in the daytime. Dan H @27, according to your link, recent daytime summer maximum temperatures in America are indeed lower than in the 1930s, but if you look at the trend in your link figure 6.2, day time summer temperature maximums are increasing slowly over the period 1970 – 2018 approximately. It’s flat looking in the last 10 years, but the linear trend from 1970 – 2018 is clearly warming slowly, and is long enough to be significant. Now I’m a lay person and so if I can grasp this anyone can. Therefore when you raise this point “Current indications are that future decreases in summer high temperatures may result in fewer illnesses and deaths” it doesnt make much sense, because even a simple linear projection has day time summer temperatures increasing in the future, albeit possibly slowly. It’s totally logical to expect global warming to lead to at least a linear increase and it could accelerate as well. But yes clearly night time temperatures are increasing more strongly than during the day.And this also results in significant illnesses and deaths, sometimes more than during the day, because the body is unable to cool down and shut off properly as below. However given evidence that heatwaves are also becoming more frequent in large parts of America as noted in your own link and below, and issues around duration, theres just so obviously a problem. And once again, America is not the whole world. I read a study somewhere which shows a clear increase recently in day time maximum summer temperatures in China. Can you point to us a single, solitary example of “…the research on the relation between smoking and cancer was conducted on the basis of double-blind, randomized clinical trials.”??? Hint: Such research has not been done. Further, it can never be done outside a Nazi death camp. Your comments on the scientific method aren’t even high school sophomoric any more. This one is downright stupid and should absolutely have been boreholed. Errr…no. Not even close to no. Like in “not even wrong”. You cannot do double-blind, randomized clinical trials on smoking vs non-smoking. Placebo cigarettes don’t exist (at least not to the extent that no one would notice they are placebos). And it is highly unethical to do such trials if there is a suspicion that smoking causes cancer. Err…no. Again, no. As in “not even wrong”. The research conducted by the tobacco companies wasn’t faulty due to bias. The research itself was often fine. It was actually reporting that research where things went wrong. Tobacco companies had internal reports for (some say) decades on animal experiments showing major side effects, including cancer, as a result of smoking. Those reports of their internal experiments weren’t published. And even when its research did get into journals, the marketing departments were doing their job in selling to the public that it wasn’t as bad, scientists were unsure, etc. etc. And this comment makes your reference to smoking and cancer even funnier, considering that several prominent scientists sounded the alarm over smoking and its connection to cancer, after doing research that showed such a strong connection. What did the tobacco industry do? It started to complain about bad science and bias of those scientists. Just like what you are doing, Victor. Consider this carefully, Victor: your behavior mirrors that of the tobacco industry in the 1960s: deny and cast doubt, attacking the scientists who showed something inconvenient. Well done. But there at the end you are slipping into repeating the problem I have been pointing out. If we observe, over a statistically significant time span, that the mean temperature (whether local or global) has shifted, that is “climate change”. Likewise if we observe an increase in local daily temps, or rainfall intensity, or any other metric we choose. You can’t say “x is caused by climate change” if x is climate change. So “x is consistent with what the Theory of Anthropogenic Climate Energy Increase (“Warming”) predicts” is really the most proper scientific statement. Your concern is duly noted. However, I was responding to a particular statement Dan made which I think represents an important misperception of the situation. I wasn’t addressing the attribution piece, to be sure, but then I wasn’t trying to–and I wouldn’t agree that every comment on this thread necessarily need do so. Um, yeah. That’s why I wrote about that part “Of course, that’s mean, not high temperatures.” Are you focusing on that because you don’t wish to acknowledge or think about the fact that ‘what I presented’ shows so clearly that the US data you are using does not characterize the global picture? I really think if you got clear about that, you wouldn’t draw global conclusions about the effect (or not) of climate change on daily high temperatures. The question is, what does one take from that graph? My point is that what’s different about the highs isn’t what’s been happening in recent decades; it’s what happened in the early part of the record. So why do you persist in seeing it the other way round, which is what you do when you conclude that ‘climate change doesn’t affect daily high temperatures very much’ or words to that effect? Is it really so hard to understand, or consider? Try looking, not at the red ‘daily high’ trace, but at the green ‘differential’ trace. Try some fits from 1970 on, and from 1990 on. Is there evidence of increasing differentials from 1970, or 1980? It doesn’t look that way. And if it’s not, then the modern warming era is *not* characterized by differential rates of increase between high and low records. If I were to take Zebra’s advice and talk about attribution, I would note that there is a very plausible explanation for the pattern seen in that graph: that of interaction between greenhouse forcing (active both during night and day, and so affecting both highs and lows) and aerosol forcing (active only during the day, and so affecting primarily the highs rather than the lows). We know that aerosol loadings decreased drastically in the US with the passage of air pollution control legislation, passed starting in the 1950s, and progressively implemented from then through the 1990s. So, if you wanted to get at the truth, you could also try looking at data on US aerosol forcings through that time. I may do so myself, if I have time later on. Unfortunately there is no way to conducted climate research double blind, which leaves the field wide open to findings rooted in bias. Do you have any references to the peer-reviewed, scientific literature that show such bias in the peer-reviewed, scientific literature? This is technically correct, but I think when people use statements like “climate change is causing more intense heatwaves’ (or whatever) its just shorthand notation to avoid a wordy definition. It’s implicitly understood by everybody that what they really mean is “agw induced global warming is leading to more intense heatwaves” but they use the shorter notation to avoid a wordy description of the issue. I’m not seeing anyone actually confused except you. Victor gets most things wrong, but you guys are misinterpreting him on the tobacco issue. Its pretty obvious by double blind placebo trials he was referring to the animal experiments, and he was arguing we cannot do these sorts of “laboratory style experiments” to determine certain aspects of the climate change issue. However this doesn’t make climate science impossible to research or biased as Victor alleges. Modelling can fill in the gaps where experiments are not possible. No, it is really not that hard to understand. The premise is that the added gases will absorb infrared radiation, and re-radiate at higher wavelengths. This effect is most pronounced at nighttime, as the radiation emitted from the earth occurs in large absorption regions. Conversely, absorption of solar radiation is significantly less, due to the lower wavelength. The effect is greatest during the longer winter nights. The effects is also greater at the poles, with much higher increases in winter minimums, and lower summer maxima. The modern era can most definitely be characterized by different rates of changes in maximum anc minimum temperatures. That is my whole point. Your last part may be the most valid. If the aerosol forcing was the major factor affecting maximum temperature, then that could explain the parabolic nature of the maximum temperature graph. Hence, the graph may be flat after all. “Can you point to us a single, solitary example of “…the research on the relation between smoking and cancer was conducted on the basis of double-blind, randomized clinical trials.”??? I’m wondering what your point is. Are you saying double-blind studies are useless, meaningless, beside the point? What? MY point is that double-blind studies are considered important as a means of eliminating the sort of unconscious bias that can too easily lead to faulty conclusions. Do a search on “double-blind”. I’ve found much in that literature that suggests bias, yes. I’ve already posted on that issue extensively. You can sift through my earlier posts and see for yourself. For starters you might want to take a look at all the many “explanations” for the hiatus, and all the many attempts to “prove” it never existed. Clearly the authors were biased in favor of the AGW paradigm, as in almost every case a different theory is presented, often in contradiction to theories preceding it. And since, according to the recent “corrections” by Karl et al., all of them had been working with faulty data, it’s quite a coincidence that all arrived at the same conclusion, no? A study by Dr. James Hansen shows that already, “Extremely Hot Summers” (defined as average summer temperatures for a particular place that are 3 standard deviations — also called “+3-sigma” — above the mean of the 1951-1980 baseline period) have increased by more than 50 times (5000%) in the past 50 years! (Recent updates show it has increased even more than 50X.) This analysis is not based on climate models or predictions. 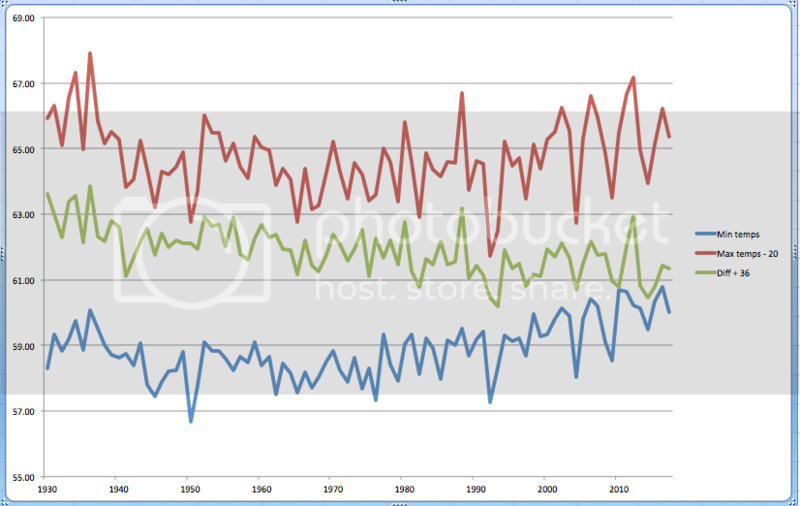 It is based on a simple statistical analysis of actual, measured temperature data from the past 60 years. This increase in Extremely Hot Summers already occurred. Note that this measurement is not the same as “Heat Waves” but is obviously related. Because of this 50X increase, when a new +3-sigma event happens in a particular place, we know that that there is a 1 in 50 (2%) chance that it due to natural variability and a 49 in 50 (98%) chance that it is due to manmade climate change. The 2003 European heat wave that killed 70,000 people was a +3-sigma event. So was the 2010 Russian heat wave that caused food prices to spike and helped trigger the “Arab Spring”. While we can’t say for sure that the changing climate caused a particular Extremely Hot Summer, we can say there is a 98% chance that it did. As Doc McCoy would have said upon reading your comment: “My God, man. What are you doing.” Google is not your friend when you don’t know what you’re doing. https://www.ncbi.nlm.nih.gov/pmc/articles/PMC3646652/ Describes whether subjects WHO ALREADY SMOKE can reliably discriminate between the experimental cigarettes SPECIFICALLY: “Subjects who had previously enrolled in a smoking study or who responded to an advertisement for a smoking study were screened over the telephone to determine if they met the following eligibility criteria: 18–64 years of age, smoke at least 10 cigarettes/day with a CO > 10 parts per million (ppm) at screening, inhale when they smoked, use other forms of tobacco less than 10 days in the last 30 days, no plans to reduce or quit smoking, no use of nicotine replacement therapy, bupropion, or varenicline in the past 3 months, in good mental and physical health, not be pregnant, and not taking certain prescription medications or illicit drugs more than twice per week for the last month.” Study 2 in this link used the exact same selection procedure. NEITHER study has ANY relation at all to a double blind randomized clinical trial which would show whether smoking causes cancer. Again to my mind this is 100% borehole fodder, but the mods see things differently. Absolutely, there’s a fun mix everywhere of physical science, rhetoric & catch phrases. Most rhetoric & catch phrases annoy me but still we should run “Are the higher nighttime lows caused by the increased energy in the climate system that primarily results from increases in anthropogenic CO2, holding other factors constant?” up the flag pole at the next Donald Trump supporters’ rally just to make absolutely certain (at that confidence level thingy) that it flies. You appear not to understand the difference between randomized double-bind and simply randomized. Further, as already pointed out, most of the double blind or randomized studies linked to in your links are randomized studies of drug treatment, not of whether cigarettes cause cancer. The heart study (Houlihan, et al.) is claimed by the authors to be a double-blind study. I would consider it instead to be a dose-response study (high dose vs. low dose, where the subjects may not be aware of the dose level). And the nature of the study would be described as a pharmacodynamic study rather than a study looking at hard clinical endpoints (such as MI, stroke, etc.). In a pharmacodynamic study, you typically look for an effect on some acute marker that you think might be related to a disease process. If you find it in a preclinical drug study, this may justify a further study in a disease model in an animal, and perhaps further (with appropriate pharmacokinetic and tox studies) in man. In a study where you are looking at hard clinical endpoints, these would be things like myocardial infarction (MI), stroke, death, etc., and they would likely be long term studies. In a cancer study, the endpoints might be cancer incidence, cancer progression, or death. As others have pointed out, running a long term randomized clinical trial to determine whether cigarette smoking can cause cancer or whether it would lead to higher cancer mortality would be highly unethical at this time, and simply could not be performed. Just a nit pick on my part. Agreed, except that I would say that solar absorption by the atmosphere is relatively unimportant, since most absorption takes place at the surface anyway, and is independent of frequency. (Quasi-black body and all.) But that’s pretty much a side note. Glad you like the aerosol idea, and there may be something to it. I still have half a mind to go and try to ferret out the forcing data to have a look. But, all that said, it would still be very strange if daytime temperatures were unaffected by the general warming. After all, it’s not as if outgoing thermal radiation is non-existent during the day, and it’s not as if starting from a higher temperature at dawn doesn’t matter, and it’s not as if all the sources of thermal inertia in the Earth system will somehow fail to manifest warming during daylight hours, too. So I’m going to go out on a limb and say that daytime highs are going to continue warming; that the result in the US will be that the next decade is in that metric hotter than the 2010s, and probably hotter than the 1930s, too. ZERO of these refs involve a randomized. double blind study to show a causal link between smoking and cancer (or heart disease either). That’s zero as in zilch, nada, none. Only a Dr. Mengele even could consider such research and to the best of my knowledge he did not. For example, the “heart disease” study whose actual purpose was “to evaluate the short-term HR changes following smoking of the first three cigarettes of the day in a double-blind study” not “heart disease” as victor stated used as subjects “Nineteen male regular smokers of at least 20 cigarettes/day having an FTC nicotine yield of 1.1 mg participated in this study.” There is no way such a design can show a causal connection between heart disease and tobacco as every subject was already a smoker. Good heavens, man. ZERO of the refs victor has provided involve animals. He’s just googling/mining for instances of contiguity of the words “tobacco” and “double blind” and expecting that to mean something. He does ZERO actual reading of the methods sections to see if said contiguity actually has any meaning re. his idiotic assertion. As is typical of deniers he just throws a lot of FUD at the wall trying to confuse issues and hoping some will stick. Or at least get in someone’s eyes. Google is not your friend if you fail to actually read what you’ve googled, vic. May I suggest you first read your own links before asking me to do anything? jgnfld@43 already pointed out that you have enormously overestimated their relevance to smoking and lung cancer. The second is by-far the worst example: they didn’t even look at cancer. The first only had an indirect link between smoking and cancer. Why did you misrepresent the scientific literature? The thing is, RC is supposed to be as far from a Trump rally as you can get. It’s supposed to be real scientists and “citizen scientists” educating the public about how science works. The very first thing you learn in science– at least, how I learned it and tried to teach it– is that you have to get the question right. From the discussions that we see on this topic, that hasn’t happened. A naive person coming to this site might get the impression that science is all loosie-goosie free-flowing interchange where the prime motivation is how many column inches a commenter can use up. Accuracy is secondary at best. If you pose the question precisely, and require people like Dan H to do the same, much more (correct) information will be conveyed to readers.